Robert Heinlein’s novel Starship Troopers is a genre-defining classic of science fiction. First published in 1959, Heinlein’s work is audacious in propounding aristocratic militarism, will-to-power, social inequality, and contempt for liberal and mercantile values. Starship Troopers describes the path of a young man, Johnny Rico, from uncertain recruit to achieving the rank of Field Officer in an interstellar war against the “Bugs,” a species of giant arachnids. 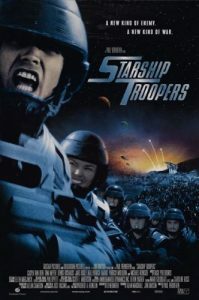 Most readers will be familiar with the themes and popularity of Starship Troopers, if not due to the original book then because of Paul Verhoeven’s movie adaptation, which, like the film Fight Club, has eclipsed its source material in the mainstream consciousness. Both the book and its movie counterpart have found enduring popularity as a coming-of-age fable of guts, grit, determination, wits, and the making of a young man. The film is obviously in line with Heinlein’s original intent, but what is less well-known is how explicit the book is in its rejection of American egalitarianism and its celebration of a sort of moral nihilism. Starship Troopers is so brazenly militaristic that it has become a Right-wing pop-cultural reference point, from the time of its original publication to the present-day memes based on the film. It is an enduring work, and its archetypes, heroes, and uncompromising ethos have the highest relevance to us today, since, like Rico, we find ourselves deep in an existential conflict with an alien civilization. The Troopers novel begins with Rico recounting how he “always gets the shakes” before a capsule drop – being launched from planetary orbit to the surface in a fragile capsule in order to wreak extraordinary havoc on the victims below. Rico and his fellow Mobile Infantrymen are characterized from the outset as having human frailty, in contrast to the astonishing savagery of their weaponry and powered armor, and yet they are the toughest men nonetheless. A regular Mobile Infantryman carries city-flattening ordnance, tactical hydrogen bombs, flamethrowers, and other sundry nastiness, and can jump-jet over buildings with ease. But Heinlein’s emphasis is not on the technological framework around the man but on the men themselves, specifically men at war. Troopers centers on the comradery, tensions, and give-and-take between troops, as well as the lived experience of military training and the soldiers’ flaws and ambitions, as well as their relation to the military as an institution. Paul Verhoeven has to be credited with making at least an enjoyable film, despite considering Troopers to be “an idiotic story.” But Heinlein is deadly serious. After the action-packed opening chapter, Rico doesn’t emerge from training until the second half of the book, around which time the Bugs are introduced – as a distant threat, not directly – and a substantial chunk of the second half is dedicated to Rico’s officer training: its ethics, traditions, and methods of drilling bright, combat-tested men into being able to command combat troops. Heinlein states throughout the novel that violence is the essence from which all political authority derives, and Starship Troopers is primarily Heinlein speaking through his character’s mentors about the utility of force, its relation to sovereignty, and its proper application. Nonetheless, for those who don’t mind a little retro-fash (portraying someone as a Nazi is really the only way Hollywood can ever portray any kind of unapologetic Rightism), the Starship Troopers film is a gripping and boisterous experience. The bugs are vicious, the acid is flesh-eatingly acidic, and all the major plot points of the novel are struck beat-by-beat by Verhoeven with a faithfulness that could only spring from an intense and fruitful hatred. There’s even creative takes that don’t appear in the novel, such as one clownish, indignant TV personality who challenges an exasperated official, claiming that he finds “the idea of a bug that thinks offensive .” (Golly, isn’t that their answer for everything?) And, of course, there are the tongue-in-cheek propaganda reels. More seriously, Heinlein’s long expositions on naked force are condensed into intimidating lectures from Rico’s Professor of History and Moral Philosophy, played impeccably by a steely and weathered Michael Ironside, who later returns to the front to fight the Bugs alongside Johnny. He executes a wounded soldier in a mercy killing, something that no doubt caused liberal audiences to cringe squeamishly (why didn’t he just let him get torn apart?!) and red-blooded American men to clench their fists in approval. Rico himself is played by the young Casper Van Dien, who in Verhoeven’s words is “the prototype of blond, white, and arrogant.” But Van Diem’s Johnny Rico is impossible not to like – he is endearingly sincere and brimming with bravado, and just so gosh-darned handsome to boot, so that the “satire” of Verhoeven’s Space Reich comes across more as a loving pastiche. One of the film’s emotional peaks is in the Klendathu Drop scene, as the Troopers come under heavy fire while they dropship down to the planet’s surface. Basil Poledouris’ score is excellent, and anyone who doesn’t feel for the young men and women launching off to almost certain death just doesn’t have a heart. For comparison, one feels nothing towards the drop troopers (or shapeless aliens) of the Tom Cruise vehicle The Edge of Tomorrow, a deeply empty film that reveals how (perhaps unintentionally) sympathetic Starship Troopers is to its core subject matter of men and women at war. B-movie or not, it’s immensely refreshing to see fashy whites taking center stage without disparagement beyond the forgettably superficial (such as Neil Patrick Harris’ SS uniform, and the Nazi flags scattered around). Verhoeven’s criticism is shallow and trite (as are his quips about how Trump’s election reflected the 1930s), whilst Heinlein’s insight into the character and motivations of men goes to the core. 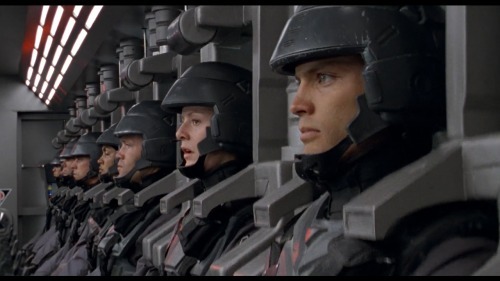 Verhoeven’s success is in accurately adapting Troopers and popularizing it by keeping it faithful to the overt militarism of the source material, and perhaps saving Heinlein’s name and novel from languishing in obscurity, beyond the ken of pop culture. He could have simply jettisoned the whole lot into the cold vacuum of space and made a boring space movie, but his liberal sensibilities were too strong. The strongest irony is that Verhoeven feels the story is “idiotic” because he himself is a Bugman. Verhoeven has been successful because the many want to see the healthy and sensible ideals of the Right espoused clearly, and Verhoeven (hilariously) is enough of a liberal Bugman that he thinks that when these ideals are clearly presented, people will see them as self-evidently wrong. 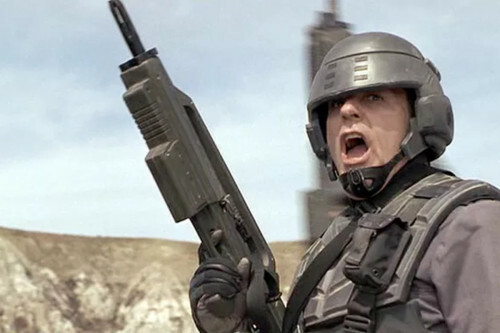 Although he strove to make a movie about young men “unaware” of the “fascism” of their ideals, the Troopers are all too aware that to abandon those ideals would mean being swamped and devoured by marauding insects – assimilated into a system of NPCs such as Verhoeven, whose greatest achievements are parodying what they despise. Once he is materially comfortable, all his pleasures and pains are private. To participate in public celebration would be to be part of an in-group: one that might demand loyalty and uncomfortable trials. Hence, the cities of the Bugman represent termite hills – vast numbers of individuals in small spaces for economic viability, all of them acting autonomously, according to their own needs. They are unable to coordinate on a larger enterprise; the idea would not even occur to them. The Bugman has nothing in common with other Bugmen except the agreement that they need not share anything in common. The Bugman’s ultimate pleasure is that which is fully engaging and immersive, and yet asks nothing of him except his time: the videogame or the cartoon novelty, which offers achievements of no significance outside its own distraction. Of course, lacking in humanity in all but the biological sense, the Bugman has no problem with mass extermination and total war to expand the hive against any and all who would challenge the supremacy of the Bug system. The Bug War may be fought by armed men, but it is in service to the Brain Bugs, the slug-like, office-block dwelling mollusks of international finance and social gimmickry. The language of “human rights” describes only a system of protocols to reduce man, the spiritual and physical architect of civilization, to the Bug status of hive functionary, consumer, and (soon to be replaced) reproductive unit. By the end of the Starship Troopers film, things are not going well for the human race. Children are being conscripted to fight, which is a source of great amusement to Bugmen, who delight in the desperation of the hated “fascists.” It is only tragic to the Bugs that those children didn’t grow up to be hive-minders performing some trivial task or the other; Bugs having no problem with stripping children of any and all sexual innocence (innocence? what is that?). In the eyes of the Bugs, children are merely small adults, and adults merely denatured worker units. It is against this menace that we are fighting. The Bugmen have already given up on life. They have decided to content themselves with their own little pleasures. But the rest of us can see all too clearly the alien and existentially threatening Brain Bugs, who are relentless in their plan to assimilate us into a greater Afro-Eurasian hive. No society has ever suffered such a grievous blow as ours. As a result, our race has not merely lost its appetite for life, but has become profoundly alienated from man the ideal, masculinity as essence, and martial valor as that which is indispensable. Thankfully, we can turn to Johnny Rico and his Mobile Infantry – and, like them, we’ll keep fighting, and we’ll win! Robert A. Heinlein, Starship Troopers (New York: Ace, 2010), p. 149. Paul Verhoeven “How We Made Starship Troopers ,” The Guardian, January 22, 2018. Chris O’Falt, “Paul Verhoeven Slams ‘Starship Troopers’ Remake, Says It’ll Be a Fascist Update Perfect for a Trump Presidency ,” IndieWire, November 16, 2016. The novel’s characterization of Rico’s father (who enlists in the Mobile Infantry after his wife’s death in the bombing of Buenos Aires), Lieutenant Raszcnak, and Johnny’s History and Moral Philosophy teacher, retired Lieutenant Colonel Jean-Paul Dubois, are all amalgamated into this one character for cinematic brevity.